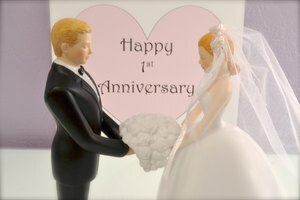 A first wedding anniversary is a very special day. An entire year spent with the one you love deserves to be commemorated in a very appropriate way. Let your husband know how much you care about him 12 months after the day you were both joined together with just the right present. Paper is one of the traditional first wedding anniversary gifts. Give your husband tickets to a professional sporting event that he really likes. If he’s fond of football, give him a leather football. Attach a card to the football with two tickets to a football game. If he prefers basketball or baseball, purchase a basketball or baseball and tickets. Some men may prefer a quiet evening at home with a good book. Think about his interests and pick out a book that you know he’ll like. Add a specially designed bookmark laminated with your picture on it and the date of your wedding anniversary so he’ll think of you when he reads it. Another favorite traditional gift for a first wedding anniversary are gifts made out of plastic. If your husband is a music lover, give him an iPod that he can listen to during the day. Add accessories such as skins that give the iPod a different look and help protect it. If your husband already has an iPod, give him CDs that mesh with his musical tastes. Show him that you know him well with a few well-chosen musical choices. If he prefers to watch television or go to the movies, find a few of his favorite movies that have come out on CD. A CD often has extra scenes that were left out of the original movie as well as commentary about the movie itself by critics or the director. This can greatly enhance his enjoyment of the film even if he has already seen it. Make your first wedding anniversary truly special with a nice vacation. A clock is another appropriate traditional gift for a first wedding anniversary. Splurge on a trip to Switzerland. This small European country has long been noted for creating coveted time pieces admired by collectors around the world. Give your husband a watch. Insert two airline tickets and hotel receipts inside the box for a truly marvelous surprise. If your budget is small, make reservations at a local Swiss restaurant for a night romance dipping food items into a communal fondue.